I’m not artistic enough. I don’t have any creativity. My pages never turn out how I envision them! I can’t find my style. I don’t know what to art journal about. I can’t do this by myself. What will others think of my work? It’s easy to worry that your page won’t turn out the way you envision or that you’ll make a mistake. Well, today I am going to help you overcome that fear and tell your inner perfectionist and procrastinator goodbye. Let’s address the common beliefs we have when we get frozen one at a time. I’m not artistic enough. I don’t have any creativity. It’s easy to be constantly told by others how creative and talented we might be – yet it’s hard to believe. But I don’t let that stop me. Remember, art journaling is not about creating a final piece that is supposed to be an artistic masterpiece – it is supposed to be a means of expressing yourself. So, don’t worry about talent or creativity. My pages never turn out how I envision them: I have hundreds of art journal pages that didn’t turn out anything like I had planned for them to. That’s just how it goes sometimes. Maybe I drew my lines crooked, maybe the paint splattered in the wrong spot, maybe my handwriting turned out terrible…you get the idea. So what? It’s okay. If anyone asks, tell them you intended it to look that way 🙂 You’re going to make mistakes on your pages. One of the reasons I love gesso is because if I’m truly unhappy with how something turns out you can always paint over it and start fresh! I can’t find my style. Ah, this is one I hear again and again. Whoever said you needed to have one consistent style through all your pages? 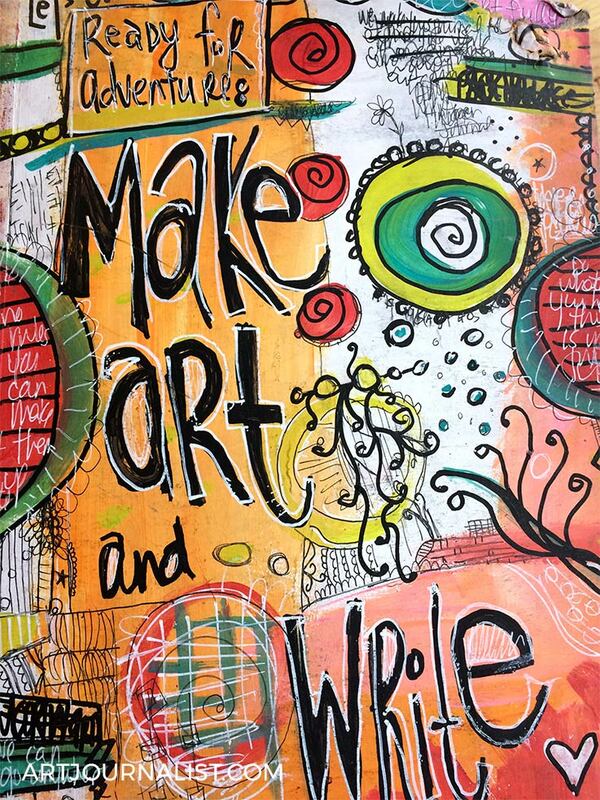 Art journaling is about creating, and creating means experimenting. Try every style you can think of and can find on the internet and can be inspired by! I don’t know what to art journal about. This is one I get stuck on sometimes when I have a brand new fresh blank book in front of me. That’s one of the reasons I created all of the art journaling prompts we have on this site! There are so many things you can art journal about…and sometimes that is the hardest part – deciding on just one thing at a time! Don’t worry about keeping a specific theme in your altered book – if you have one you like great, but if not, randomness is okay too. I can’t do this by myself. You don’t have to! We created our Facebook Community so you can ask any questions you have along the way anytime. We’ll also be adding plenty of tutorials that will walk you through step by step some of our favorite art journaling techniques. What will others think of my work? Well, you only have to share what you feel comfortable with sharing! You don’t have to share your pages unless you want to. Some people will love your work and others may criticize it. I know not everyone loves the pages I make, some may find them too messy, unorganized, not artistic enough, etc. etc. It doesn’t matter what others think – what matters is you found a way to express yourself and your thoughts! In fact, the worse you feel you are at art journaling, the more I encourage you to share your work, as it will only help you learn and grow as an art journalist! Still stuck, eh? That’s okay! Here are some things you can do right now to get past those negative self talkers in your head: Free Write: Anything in Your Head for 5 minutes, Then Cover With Marker, Paint or Gesso Try to Make a Bad Page on Purpose – yeah, see how terrible you can make it! See my art journal fails for some inspiration! Try and challenge yourself to make something worse than this! Do you ever get stuck in creating art journal projects? Do you have any advice for someone just getting started who may be battling their inner critic? I’d love to hear your thoughts in the comments section below! Thanks for the tips. I struggle with the style think a lot. I am drawn to so many artists who are vastly different from one another. I find that I do a lot of different things in my journal. Thanks for the validation that I am not an artist because I try different things. Thanks for your contribution to art journalists. I am enjoying your page very much. I am a fine arts photographer, artist and writer. Your courses and ideas are helping me to incorporate all three interests. I am just starting my own web page, and you are encouraging me to continue. (photosbyeveline.weebly.com) Thank you. Thanks for the tips…I am an art teacher and hope to use these tips with my students. I read this blog post this morning and it so screamed, “ME”!!! I get hung up on the perfectionism and don’t allow myself to be free. Even as a little girl, I had to make sure my coloring pages were perfect, yet always found fault in them. Thank you for posting these tips for people like myself, who are just now (at age 55) being able to think outside my box! I agree with you whole heartly, at 54 I am in the same boat, always felt that things had to be prefect, could not think or see outside the box. Nice to finally find others that think and feel the same. I also felt like you were talking about me. I have been my own harsh critic for way too long and have used each one of these excuses. Thanks for the tips. I am happy I stumbled upon your post. Oh wow!!!! Thank you so much for the inspiring words..I sooo relate to all that you saying! !! I constantly say to myself..” be freeeeeee.. it is only a piece of paper” !!! But the perfectionist in me always tries to take over and spoil things for me! ! What a great idea….I’ve done it myself a few times, and you’re absolutely right. By the time you adapt it to what you have on hand , your own supplies, and make changes that occur to you while you work, it’s totally your own by the time you’re done. Great way to get UNSTUCK! Maybe a little tip for those who get stuck: when i have that horrible moment i just scroll down on pinterest , sometimes several hours a day, just to see what other people do. It really opens your eyes and many possibilities! and when you see something interesting at pinterest, just try it! Thank you for taking the time to write this wonderful article! I read every word you wrote and every comment that you got. Lots of terrific advice! I’m just beginning to dabble into the Art Journaling world. It’s so intimidating to see all the wonderful pages out there. But I will keep at it because it is so important for personal development as an Art teacher. These tips are great! Thank you! I’m a struggling design student, and THIS POST was my LIFESAVER! Good luck in future endeavours! I once painted something that I was not proud of, but it turns out everyone had chosen that one as their favorite. Just because it’s not up to your standards doesn’t mean that it doesn’t match up to others.